I’m calling for a new religion based on the film The Brave Little Toaster. This is no joke. This new religion will replace Christianity which has been in need of a major upgrade for at least a thousand years. But don’t worry, in replacing it, the core message that has been obscured over the years will remain intact and for once, actually emphasized. This new religion will allow us to really focus on the living message, rather than being bogged down by all the useless dead doctrine and nitpicking inherent in popular Christianity. Imagine it: instead of reading a boring bible, all you have to do is watch a super entertaining cartoon and you got it! No rituals, no guilt, no confusion, no condemnation—just the Christ story redone and undiluted. No more Christianity! Toasteranity! Once ordained as an official religion, no one’s going to interpret a cartoon about a toaster literally. Everyone with half a brain will know it’s a metaphor. Well, you never know. I could actually see someone worshiping their kitchen toaster if it meant not having to dive within. Okay, so here we go. 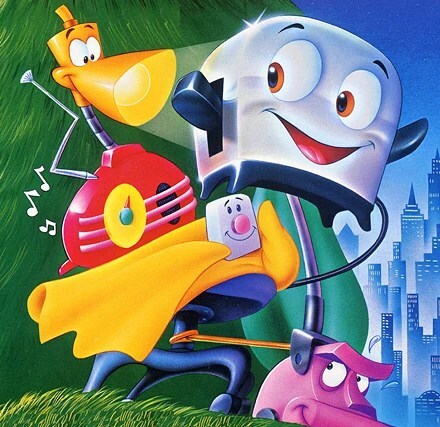 The Brave Little Toaster is about five appliances in an empty house who feel alone and abandoned by “the master” who is away at college in the city. These appliances–a toaster, lamp, radio, blanket and vacuum cleaner–feel sad and unfulfilled in the absence of the master, because in the world of appliances, fulfillment is only achieved in being operated by the master. As mere appliances, their sole function is to be used. This is our sole function too. We are also appliances to be used by the master, the father, life, etc. As appliances, we are in the same predicament as the toaster and his gang. No matter how many other people we surround ourselves with, we still feel abandoned and unfulfilled and just want to be used again. But union with the master is beginning to feel like something from a forgotten dream. Blanky actually enters this dream space when he encounters the master in a mystical vision wherein he and the master approach each other in slow motion (this scene gives me the chills every time). But alas, this dream of union is torn apart prematurely by the harshness of “reality” and the realization that the master may never come back. And so, rather than continuing to mope around all day, the appliances set out on a journey to find the master. Their journey is the Christ story, the spiritual journey we all embark on. Because you are them! That’s right. Toaster, Blanky, Radio, Lampy, and Kirby the vacuum make up a single universal entity that is YOU! Let’s look at it in more detail. Toaster is Christ, the real you, the witness, snow white. You are the reflective awareness that holds the bickering aspects of the ego (the rest of the gang) intact. The real you is the space that allows the bickering to happen. Toaster is the least entertaining character because he has no personality of his own, he simply reflects. In fact, he’s not even technically a “he.” The goal during the casting process was actually to make the toaster as gender-neutral as possible, because the toaster represents the self that is the same in every man and female. Blanky, an electronic blanket, is the baby of the group, the one who is only interested in snuggling. He is the part of your ego that is naive, innocent, timid, sensitive, tender and loving. As a result, he is closest to the master, hence the vision. He’s also the one who carries the master’s portrait around, ever careful never to lose it. Radio is the intellect. The big shot navigator. He leads the way the first half of the journey, but eventually his navigating skills become increasingly useless. Yet, he is always there to make light of the situation, continually spouting clever puns and witty quips. Lampy, the lamp, is ironically the dim one who is always trying to understand or shed light on everything otherwise he feels left in the dark. He is the part of us that is curious, unaware, goofy, yet very creative–his far-fetched (light bulb) ideas often bail the group out of trouble when things look their worst. Kirby, the vacuum cleaner, is the military man, the part of us that wants everything tidy, structured and in order. Therefore he has little time for things like emotion, so he hides that kiddy stuff whenever it comes up in him and as a result, ends up literally carrying the baggage. He carries the brunt of the ego in that sense. Because of this, Kirby tends to be detached, grumpy and abrasive. Yet he is strong, and without him, the rest of the gang would not survive the outside world; In fact he actually serves as the vehicle to carry the group through the outside world. This entry was posted in Uncategorized on August 31, 2013 by imchrist.